Honey bees are well known for their waggle dance. A worker bee who has returned back to the hive from foraging will waggle her body as she walks in a straight line (waggle run) before turning either to the left or right and return to the starting point. This signature dance provides other bees within the nest with information about the presence, location, quality and odour of profitable food sources. The fellow bees are able to detect the direction and distance vector from the nest to the feeding location, from this information rich waggle run. Depending on the resource quality and nectar availability, the dancing bee may perform anywhere from 1 to 100 or more waggle runs. waggle run affect dance follower behaviour. Three colonies of honey bees (A. mellifera mellifera), were housed in glass-walled hives in a laboratory kept at 20°C. This allowed for monitoring of good health and similarity between colonies during the experiment. The hives were connected to the outside world by a plastic tube which allowed foragers free flying access. Each colony had a queen, brood, 5000 workers, honey stores and space to sore extra honey and pollen.The waggle dances were recorded by cameras that were directed towards the area of most dances (the “dance floor”) each day. To determine dance follower behaviour, followers were identified as bees that were facing the dancer during the waggle run and following the dancer's movement. How many waggle runs each one of these dance follower bees followed gave a dance follower duration time. This dance following behaviour was carried out in four months (September 2009; April, May and July 2010) when food abundance and average foraging distance varied greatly and where three seasons (spring, summer and autumn) were also accounted for. workers follow fewer waggle runs as the food location distance increases, but they will invest more time in following each dance. Bees might not need to follow as many waggle runs to get accurate information on distant food source direction but when learning the precise distance of this food source they need to follow more waggle runs. Worker bees followed slightly more waggle runs for distant food sources when angular variation among waggle runs was greater, this suggested that followers might compensate for low signal quality (low signal to noise ratio) for distant food sources by investing more time in dance following. I think it is pretty cool that bees are able to communicate in this way, and learn so much from a few dance moves. However I would make a horrible bee because I am so uncoordinated when it come to dancing/trying to learn dance moves! For most of us, lying in the sun turns us bright pink however the Chameleon grasshopper (Kosciuscola tristis) turns bright turquoise. Found across the alpine peaks of the Australian Alps, male Chameleon grasshoppers will rapidly change from black to a bright turquoise colour with increasing temperatures, returning to back to black when they cool down. In order for this temperature-dependent colour change to occur black males need to bask each morning for approximately 21-39 minutes at a temperature of ~25-30°C to transform into their brightest turquoise. Once this intial colour change takes place the body temperature of the grasshopper may lower below 25°C, but the grasshopper keeps its blue colour as the change back to black is not as fast, generally taking about 5 hours. These extraordinary males are also known to engage in fierce fighting amongst each other, as they compete for females (Check out the video below). And to assess if male mating success is influenced by turquoise brightness in males, trials in which five males competed for one female were carried out. Results show that male colour is not a big factor in mate selection for females, as they chose randomly with no preference for the brighter males over the duller males. And there was no evidence that brighter turquoise males were more successful when it came to fighting other males for a female. However it is thought that the males, "check each other out" comparing themselves to other males of similar brightness to assess their own fighting ability. This allows them to make a decision whether or not to engage in a fight due to past experiences, brightness may be a cue to the fighting ability, so a duller male will most likely not chose the brightest male to contest but instead pick on someone his own colour. So this goes to show that "appearance" isn't always everything when it comes to mate selection in nature... it doesn't matter if your blue or black! But when you want to fight someone, it pays to stick to picking on someone your own size or in this case colour! I find these wee guys fascinating, such a cool colour change, may have to go see them myself one day! Check out these males fighting! Stumbling across a pile of dung is unpleasant for most but strangely enough one invertebrate species will happily break out it's dancing moves upon this discovery. When a suitable dung pile is located, the Dung beetle will cut off a piece of dung and shape it into a ball. Breaking out its signature moves the Dung beetle will then get its boogie on and perform a characteristic dance by climbing on top of the ball and rotating about its vertical axis. Afterwards the beetle will roll its dance partner in a straight line away from the original dung pile to a secluded location for burial and consumption. It is remarkably fascinating, that these little fellas are able to control the direction it which they travel given the fact that they do this facing backwards with their head pointing towards the ground. The initial dance at the dung pile, aids the beetles, as they store a compass reading from celestial cues, when the rolling begins the beetles try to then match they cues they see with their store compass reading, enabling them to move in the most direct route; a straight line.This interesting feature of the Dung beetle's behavior ensures a safe path for the beetles; so they do not return to the intense competition from fellow beetles (stealing a ball from another is easier than making one) occurring around the dung pile. Circumstances that lead to this behaviour in Dung beetles have been explored to determine whether the Dung beetle dance is an orientation mechanism. In the article I reviewed (The Dung Beetle Dance: An Orientation Behaviour), they concluded that most beetles perform a characteristic dance. An increased likelihood of this dance being performed can be triggered when control of the ball is lost or the beetle encounters an obstacle. Results also showed that physical disruption is not the only disturbance to initiate the beetle's dance moves; changing the orientation of the beetles relative to the position of it's visual cues or the position of the sun can also cause the beetle to perform it's dung n' roll moves. It is thought that the dance is a behavioural mechanism as the straight-line orientation of the beetle's ball-rolling allows them to 1) establish a bearing in which to roll and 2) if their roll path is unintentionally disturbed the beetle has the ability to return to this select bearing. 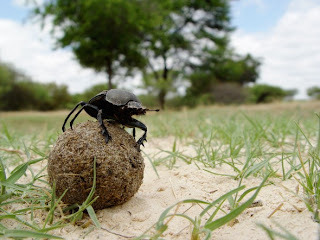 The Dung beetle is unlike many other animal navigators as it does not aim to find its way back to a familiar location after foraging but instead they need to roll their balls from a known location to an unknown secluded location, in the most direct and efficient route possible; a straight line. Thanks for reading, I hope you learnt something new!